Hi, updated the GRBL to 1.1 using the installer but it doesn’t seem to recognize the homing switches anymore. They all worked fine with v3. I held the z-axis switch while updating. Now my machine is a giant paperweight. I can’t even run it without the jog panel. Can I downgrade to the old GRBL and CM v3? 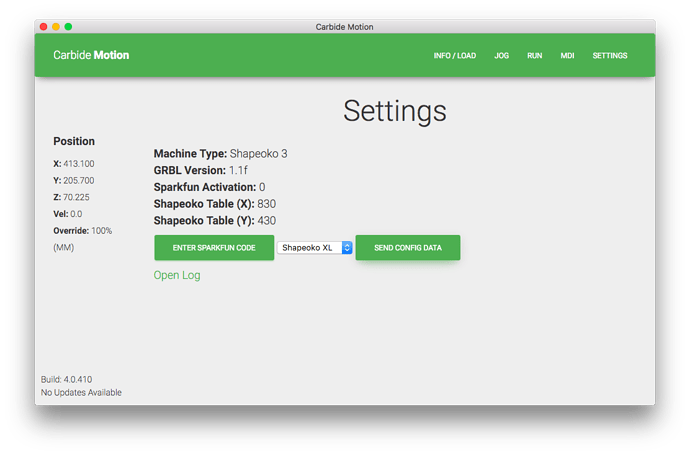 To get homing working, it should “just work” — verify your settings against: http://docs.carbide3d.com/software-faq/shapeoko-3-default-grbl-settings/ and see if http://docs.carbide3d.com/shapeoko-faq/shapeoko-enable-homing/ helps. I upgraded like you and was a bit confused at first because the “Toggle Shapeoko Homing” button wasn’t there but it seems that sending config data did enable the homing switches. Did you click the jog button at the top when you’re on the screen you posted the pic of? Thanks, guys! I was able to still home the machine on the jog tab. The button still doesn’t show up on the settings page…but everything seems to be working. The instructions page might need to be updated if this is the new normal. Might keep others from freaking out like me. Yes, the instructions for that reflash mention nothing about the “Enter Sparkfun Code” button but instead show a picture of that button reading “Toggle Shapeoko Homing”. Definitely confusing. Im working through this also right now. Am I good as long as the homing button appears on the jog screen before the actual jog buttons do? Yes, homing is now mandatory, so it’s always on and there’s no button option for turning it off.